Habig played his college ball at Purdue, starting the final two years and being named the Boilemaker's MVP in his sehiior year in 1957. Habig was drafted in the 27th round by Green Bay in 1968, but was lured north to the CFL. Neil Habig played seven years in the CFL, all with Saskatchewan from 1958 to 1964. In those seven years, Habig was a West All-Star six times, missing out onlyin his first season. 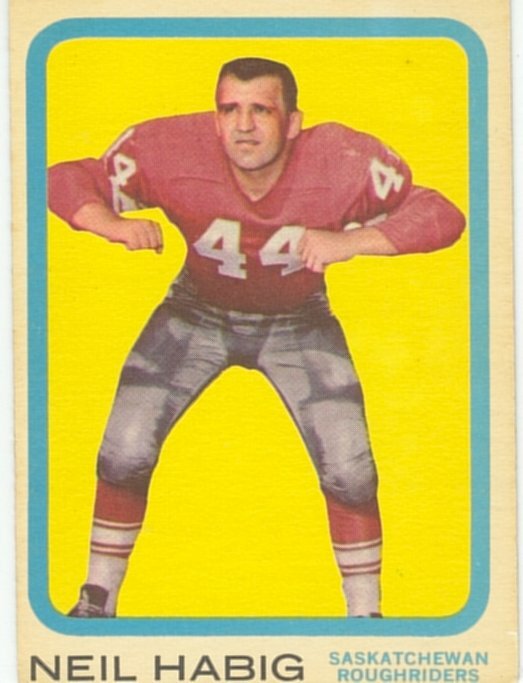 Habig was also a CFL All-Star at center in 1962, the first year CFL All-Stars were awarded. Besides playing offense, Habig was a solid performer on defense where he played linebacker. Habig had 10 career interceptions, including seven in 1963.